Cottle County was created in 1876 from Fannin county and was attached to Fannin for administration until 1887 when it was attached to Childress County for administrative purposes. Cottle was organized in 1892 with Paducah as the County seat. It was named for George Washington Cottle, 1811-1836. Cottle was one of the 183 men who died defending the Alamo. The first inhabited area near the county was Tee Pee City, an old Comanche campground in Motley County just west of the Cottle County line began about 1875. Located near the confluence of Tee Pee Creek and (Tounge) Middle Pease River as a trading post for the buffalo hunters and surveying parties. The wide open settlement with its shootings and drunken brawls was such a bad influence that the Matador Land and Cattle Company declared Tee Pee City off limits to its cowboys. When an opportunity arose, the ranch bought the land Tee Pee City was located on and closed the site down. 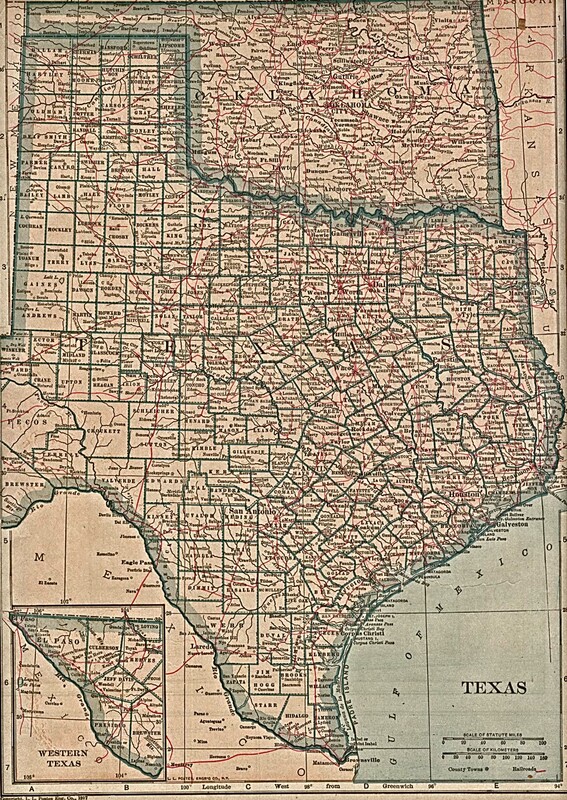 Cottle County located in Northwest Texas, below the High Plains is served by two principal highways, US 62/70 (east to west) and US 62/83 (north to south) and is located halfway between Lubbock and Wichita Falls. The County is rugged in the west and level in the east. It is drained by the Pease, Tongue and Little Wichita rivers. The primary income (abt 33 million) for the county is from cotton, grain, cattle and alfalfa. A modest amount of oil is produced in the county, 137,489 barrels for 1990. The towns of the county were Otta, Dumont just South of the Cottle/King county line, Delwin, Chalk, Sneedville, Narcisso, Paducah, Ogden, Swearingen, Dunlap, Cee Vee, Coleyville, Finley, Valley View, Hackberry and some I am sure I've missed. In the early days of Cottle County ranching was the main industry. Cottle and neighboring counties, King to the South, Motley to the West, Childress to the North, Hardeman and Foard to the East soon became the center for huge ranches. The 6666, Moon, Pitchfork, Matador, JY, 7L, Ross, Mill Iron, Hat, Ox, SMS and 3D. The men and women who left their mark in these five counties, Samuel Burk Burnett, 6666; Anne Burnett Tandy, 6666;Anne V.(Little Anne) Windfohr Sowell and Windi Phillips, 6666; Thomas Llyod Burnett, 7L; W.Q. Richards, Moon; Robert Benjamin Masterson, JY; Alford M. Britton and Henry H.(Hank) Campbell, Matador; J.J. McAdams, Hat (the present day Triangles); Forsythe brothers, D.D. Swearingen, G.S.White and C.R.Smith of the OX; and all those working cowboys who made the big ranches what they were then and are today. Most of these large ranches are still in operation today. The big ranches began fencing their spreads and farmers setteled on the lands. Cotton soon became the crop of the county. At first cotton was hauled to Quanah, about 50 miles away which was the nearest gin. Gins sprang up in most of the communities of the county. I think Paducah had seven or eight at one time. In 1900 cotton was planted on 749 acres of Cottle County and by 1930 cotton cultivation had expanded to 133,467 acres. The economy was aided by the Quanah, Acme and Pacific Railroad in 1909. Auto roads to Childress and Matador were completed by 1910. The first hard surface road was from Paducah to Dunlap that was built in 1913. With the towns came schools, churches, law and order, butchers, hotel operators, merchants, blacksmiths and all others that settled the county. The population of the county grew from 24 in 1880, 240 in 1890 to 1,002 by 1900, 4396 in 1910 and 6901 by 1920 and a county high of 9395 in 1930. During the "DustBowl" and "Great Depression" of the 1930's the population trend reversed. The 1930's started an exodus of farmers from the county and by 1940 the population dropped until only 7,072 remained. The population continued to drop in the coming decades 6099 in 1950; 4207 in 1960; 3204 in 1970; 2974 in 1980; 2247 in 1990; and 1927 in 2000. In the 1940's the schools began to consolidate into the Paducah Independent School District. Most of the community school buildings are gone. The Alamo Elementery School fell recently. All that is left is the rock fence that encircled the playground and building. The land is now the Alamo Park donated to the City of Paducah by the Paducah Indenpendent School District. Automation soon changed the way farming and ranching was done. As the changes began to take hold the younger population began leaving the county for the larger cities. Farmers increased the size of their farms and reduced the workforce. These volunteers have materials they will do look-ups in. Please consider volunteering if you have any Cottle County material.